I have always loved color blocking and Ariel is a Disney princess who does it well. The Little Mermaid is known for her purple seashell bra, green tail, and her flowing red hair. So I figured I'd turn her look into fashions that could be worn anytime of the week for any occasion. This look could be worn on a casual date night. I would definitely wear this purple crop top with the green maxi skirt . I decided to pair this look with some simple red ballet flats . It's a perfect outfit for this time of year and you could layer it with a red sweater if you wanted. I even found a Little Mermaid backpack that would perfectly complete this look or any of the following looks. This would be Ariel's go-to everyday look. Fitted green skinny jeans with a purple fitted cardigan layered over a plain purple t-shirt . I am in love with the quilted red purse with the big bow . It definitely looks like something Ariel would carry and wear with red booties . This outfit would be perfect for the Fall. This is what I picture a modern day Princess Ariel would wear if she went for a run. The outfit shown above would be perfect to wear when you are going for a nice jog. The green leggings are fleece which are perfect for the Fall. 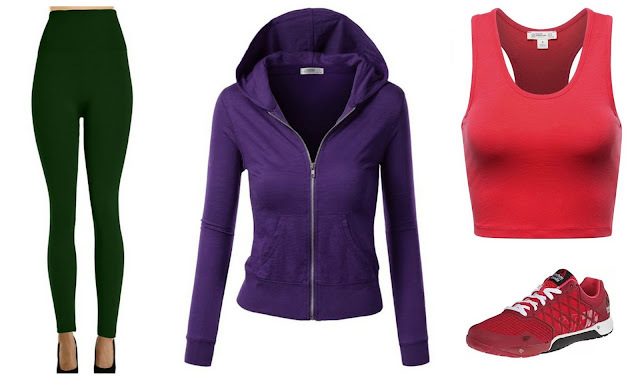 The purple hoodie will be sure to keep you warm while wearing the cropped red top underneath it and the Reebok training shoes will be sure to keep a pep in your step whether you're running or walking. This would be Ariel's night on the town look. I absolutely love the way the purple dress and the way it flares out. The red cardigan would be perfect for keeping your arms warm. The accessories also fit Ariel's mermaid persona. The green heels and the green rhinestone clutch bag are gorgeous, but the finishing touch would be the starfish earrings . The business version of Ariel would wear something similar to this. A fitting green midi dress would be appropriate for work with a chunky red cardigan layered on top of it. I found a vibrant purple bag that would be great for carrying papers and whatever else you'd need to bring to work. Those purple flats would also be great for walking around your job without causing your feet too much pain. Last but not least, accessorizing your ears with clamshell earrings gives this work attire a splash of fun. Would you guys dress like Ariel? Would you wear any of these outfits? 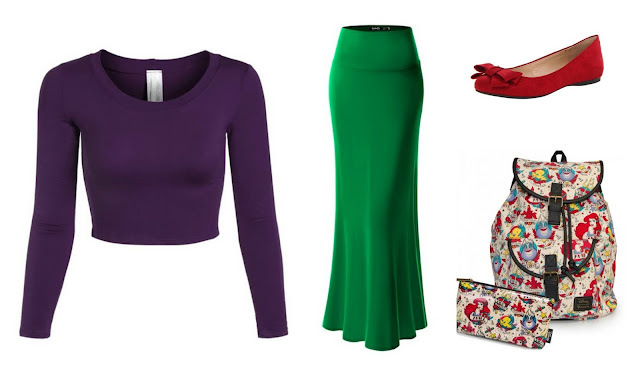 What other Disney characters would you like for me to create fashionable looks for? Leave a comment down below and let me know what you think. This post does contain affiliate links and I will be given a small compensation if you make a purchase. I will be paid a small amount if you purchase from any of the links on this website. $30 Gift Card AMC Giveaway Ends April 19th! © 2017 Researching the Internet | All rights reserved.. Powered by Blogger.